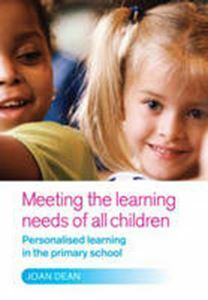 Quick overview Personalised learning involves helping each child to reach his or her full potential - intellectually, personally and socially. Written by an experienced teacher and author, this book unpicks the concept of personalised learning and shows teachers how to apply it to planning, teaching and assessing learning. Personalized learning involves helping each child to reach his or her full potential - intellectually, personally and socially. To achieve this, teachers need to match learning opportunities to the learning styles and experiences of the children, taking into account individual differences in culture, language, background, ability and interests. For many teachers, individual learning has always been at the heart of what they do in the classroom. In this book, experienced teacher and author, Joan Dean, unpicks the concept of personalized learning and shows teachers how to apply it to planning, teaching and assessing learning. The book is accessibly written and gets right to the nitty-gritty of what personalized learning looks like in the classroom. It covers: * a whole-school approach to personalized learning * getting to know the children * working with boys and girls * providing for children with special educational needs * providing for very able children * providing for children from other cultures * providing for bilingual children * providing for children from different social backgrounds * working with assistants and volunteers.